The wait is over! 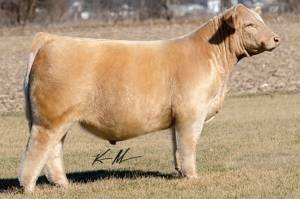 Here’s your Charolais Composite Bull that is Tested TH, PHA, and DS CLEAN. With the over whelming popularity of Charolais influenced cattle, the industry has accumulated many TH and DS dirty females. Rocket Fuel is not only bred for, but built to breed to every one of those Dirty Composite Females. Rocket Fuel is just like many of the other sires we offer, built from the ground up with a big ol’ foot under him, sound functional leg with plenty of mass, the right amount of body, stout muscled and very attractive. So board the shuttle and let Rocket Fuel propel your Charolais influenced cattle to new heights.